“This is the Zodiac speaking…” Travel through this David Fincher directed portrayal of a real life murder mystery and modern Jack the Ripper story that has never officially been solved. Starring Jake Gyllenhaal as San Francisco Chronicle cartoonist and Robert Graysmith, who becomes obsessed with the police investigation and press reports. His obsession with finding the killer drives away his wife and kids as he is swallowed up by his search for the truth. Robert Downy Jr supports Gyllenhaal’s lead as crime reporter, Paul Avery, who is targeted by the Zodiac killer after calling him a “latent homosexual” in one of his reports. This leads him down the rabbit hole of paranoia as he drinks himself to death. Mark Ruffalo’s turn as officious, yet eccentric, San Francisco Police Inspector David Toschi, provides the factual reality to Graysmith’s unsubstantiated theories. 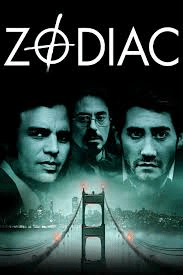 A story based largely on the police reports from San Francisco, Vallejo and Napa County in California, which made up the Zodiac killer’s hunting ground, as well as the critically acclaimed novel Zodiac, written by Robert Graysmith. Fincher vividly tells the tale in a procedural format, similar to how the police carried out their investigations. The film starts on July 4, 1969 with the shooting of a couple on a lover’s lane. The killer then reports his crime to the police, taking credit for the double murder and describing the type of ammo and gun he used to verify his story. One month later the killer sends a letter, calling himself “The Zodiac”, and a cryptic puzzle to the editors of San Francisco’s major newspapers and police. Then, on September 27. 1969 in Napa County, he attacks a couple picnicking, tying them up and stabbing both in the back and torso, again taking credit by calling 911 and reporting his crime. Two weeks later he kills a cab driver in San Francisco and mails pieces of the dead man’s shirt to the San Francisco Chronicle.